This recipe produces a moist, rich bread. 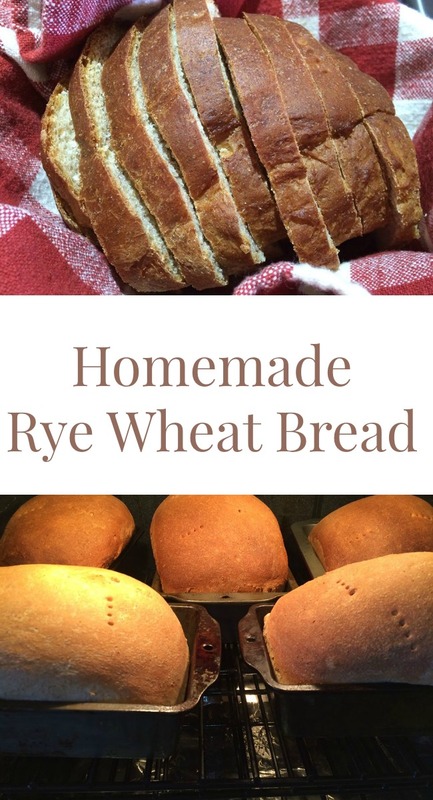 In addition to rye, wheat and white flour, you will need eggs, instant potatoes, margarine (or butter), milk, salt, sugar and yeast. Don’t panic because of the ingredients. It’s still an easy recipe. You’ll dissolve the yeast in warm water, then mix the dry ingredients together. 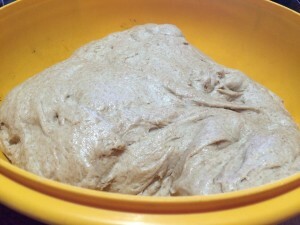 Add the melted margarine (or butter) and milk to the yeast mixture and all the dry ingredients to the wet mixture. For this recipe, you only need 1 Tablespoon of yeast. I sometimes add a little more if I’m in a hurry to get the bread rising. 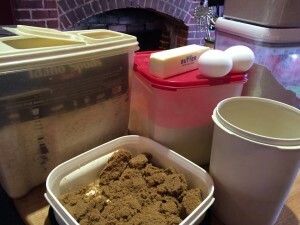 For bread with yeast flour, one thing you want to do is make certain that you don’t add too much flour. Add a little at a time until it is mixed in well. You’ll want this dough to be a tad on the sticky side. 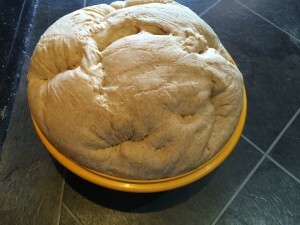 Put the dough into a greased bowl and let it rise three times. ready for the first punch! You punch it down the first time and let it rise again. 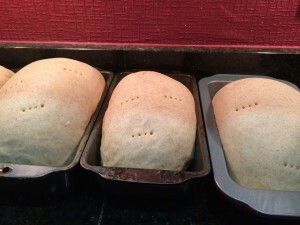 After you put the bread into loaf pans, you let it rise again. 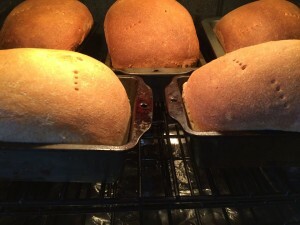 I always prick my loaves with a fork; it helps the air escape and keeps the tops from developing bubbles or cracking. 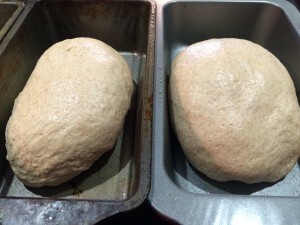 Let the loaves rise and then put into a pre-heated oven. The temperature is 425 and you only need to bake it for 25 minutes. Remember that the wheat and rye will make it look darker, so you don’t need to think it’s getting too dark. This bread is excellent for toast or for grilled cheese sandwiches. It’s a moist bread and not as dry as a lot of bread with whole wheat flour in it. 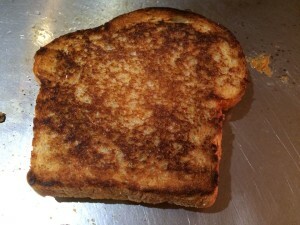 A grilled cheese on rye-wheat bread. You can slice the bread and put it in the freezer. Then when you want a few slices, you can just take out the amount you need. Here’s the recipe. And a confession: this is not Dave’s favorite bread recipe. 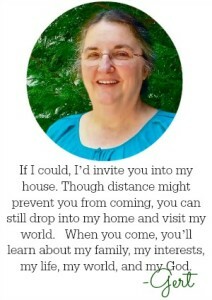 So after making this one and hearing his many hints for his favorite recipe, I made that one, too. I’ll post it another day. A little extra effort because of additional ingredients, but well worth the time! 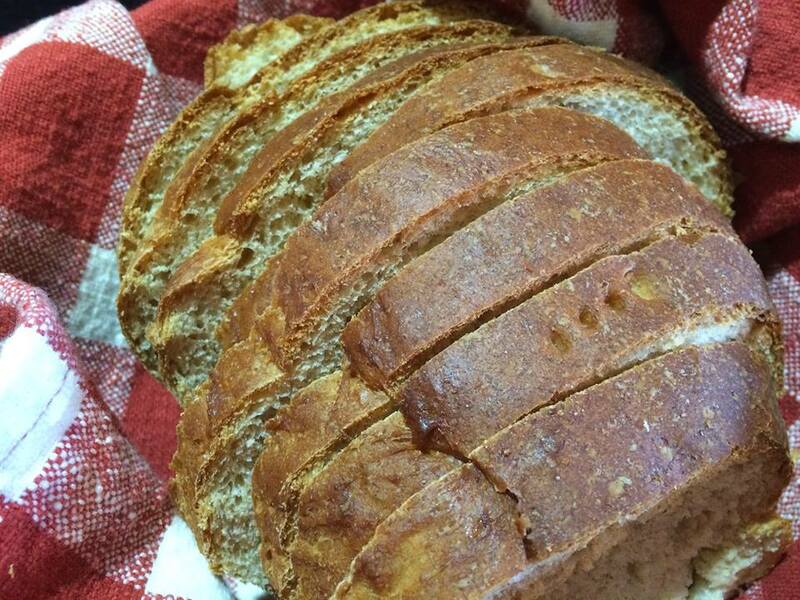 This moist wheat-rye bread is excellent toasted or just served plain.